Cold winters can mean dry, cracked, or extra sensitive paws for your pup. The elements can be brutal, so check out these tips to keep your dog’s paws nice and safe in the cold! Preventative measures are the best way to ensure your pup’s paws stay healthy. Carefully trim the hair around your dog’s paws so their hair stays short and doesn’t irritate the surrounding pads. No hair should come in contact with the ground! You should also keep your pooch’s nails trimmed to further prevent the snow and ice from building up in their paws. Another great preventative measure to keep your dog’s feet fresh and out of the cold is dog boots! Stylish and practical, dog boots will keep your dog’s paws out of harm’s way in brutal winters. They consist of sock-like boots with Velcro straps that keep them nice and snug on your pup’s toes! Many dogs don’t like wearing boots at first, so give them some time to acclimate before venturing out for longer walks. Salt and many other de-icers can be extremely irritating for canine paws! When possible, keep your dog away from roads and sidewalks that have been recently salted. After you take your furry friend on walks, rinse their paws with warm water to get the de-icing chemicals out of their sensitive paws. Additionally, you should keep your dog from drinking out of puddles on heavily salted sidewalks, as they could be ingesting potentially toxic chemicals. 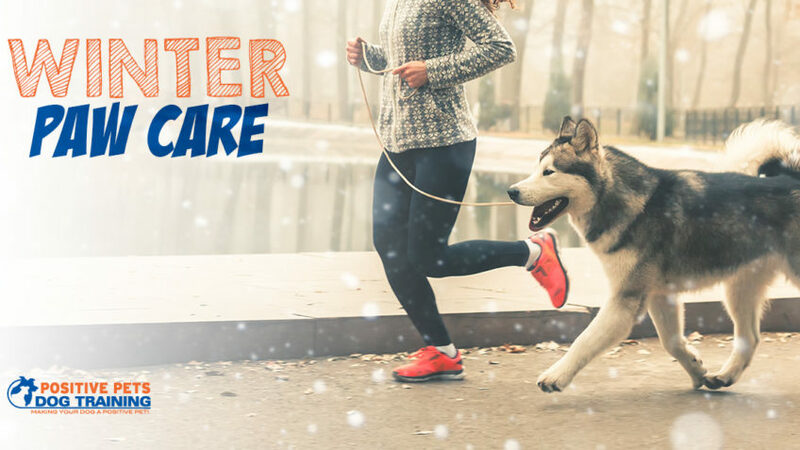 You and your dog will be fully equipped to take on the harsh winters with these tips! Winter wonderland, here we come!